Kodiak Island is the nation’s second largest and was discovered in the 1700s by Russian Fur Traders – it is now a top tourist destination. 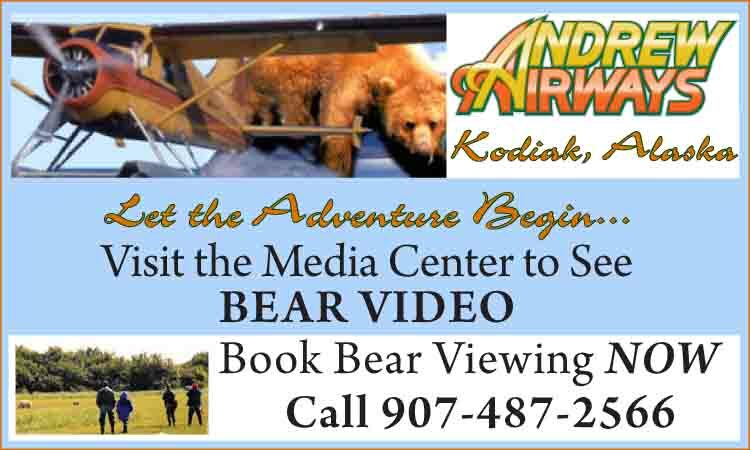 The island is also home to the Kodiak Brown Bear, where you can view this amazing species on the ground in their habitat or from the air on a flight seeing tour. Sport fishing is another popular activity. Private fishing boat charters offer excellent saltwater fishing from April through October while commercial fishing vessels work the waters all year long. At the end of the Aleutian Island chain is remote Unalaska/Dutch Harbor, the only place to be bombed by the Japanese in WWII other than Pearl Harbor and departure point for the fall and winter crab fishing fleet of “Deadliest Catch” fame. Ancient glaciers and millennia of stormy weather have sculpted Kodiak Island's granite core into rugged mountains and intricate shoreline. This dynamic land is home to an abundance of wildlife. Whales and sea otters feed in bays. Enormous bears roam meadows of waist deep grass and salmon return to nearly every stream. Kodiak’s lush green mountainous landscape has been compared to Ireland’s, hence the nickname Emerald Isle. 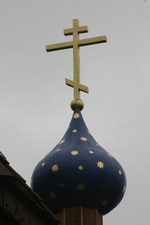 The oldest community in Alaska was established on Kodiak by Aleksandr Baranov in 1792 when Russian rule dominated the northern region of the Pacific Northwest; the oldest Russian Orthodox Church outside of Russia was built here in 1794; Alaska’s oldest standing building is the Russian American Magazin, built in 1808 as a fur warehouse. The City of Kodiak is the largest seaport in Alaska with the second largest fishing fleet in the US, while the Island’s waters have been judged to offer the best sport fishing. When “driving” to Kodiak Island, allow plenty of time to enjoy the Sterling Highway on the Kenai Peninsula into Whittier or Homer; the snow capped mountain ranges, pristine rivers, spring wildflowers and autumn colors will remain a memorable experience. Board the M/V Tustumena in Homer or the M/V Kennicott in Homer or Whittier and continue your “drive” on the Alaska Marine Highway – a 12 or 16 hour ferry boat ride across the Gulf of Alaska. Another option is to leave the vehicle on the mainland and rent one on Kodiak Island; come aboard as a walk-on passenger and reserve a cabin for a good night’s rest. Kodiak Island has wonderful bed and breakfasts, motels and lodges to accommodate your retreat into the wilderness. The island's original residents, today known as Alutiiq or Sugpiaq, arrived on Kodiak over 7,500 years ago, probably from the Alaska Peninsula. Plentiful evidence of Alutiiq petroglyphs date from this time and archaeological studies indicate that these early people lived off the sea, pursuing the sea mammals, fish and birds that still influence the island’s economy. 215 Mission Road Suite 101 Kodiak, AK 99615. (907) 486-7004. Admission $5.00 adults. Visitors to Kodiak can learn about its 7500-year-old Native heritage at the Alutiiq Museum and Archaeological Repository, a cultural center governed by the Alutiiq people. Exhibits of artifacts, photographs and contemporary art explore Alutiiq culture and illustrate how traditions continue in the twenty-first century. The museum cares for over 290,000 items, leads archaeological digs and local cultural research, and hosts educational programs that invite people of all heritages to share in the exploration and celebration of Alutiiq culture. 101 Marine Way, Kodiak, AK 99615. (907) 486-5920. Admission $5.00 adults. The Museum has an exceptional gift store. . Hours: Monday-Saturday 10 to 4 PM. Closed on Sunday (except for cruise ship days). Originally known as the Russian American Magazin and later as the Erskine House, Alaska’s oldest building now houses the Baranov Museum and is on the National Register of Historic Places. After an earthquake and tidal wave nearly washed the settlement into the sea, Baranov moved the entire community to higher ground surrounding the harbor of St. Paul. Today, the museum showcases the art, craft and legacy of Kodiak Island history and its residents. 414 Mission Road Kodiak. (907) 486-5532. 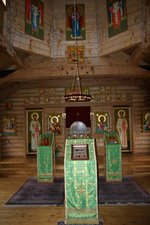 The church serves as the oldest Russian Orthodox parish in the New World. 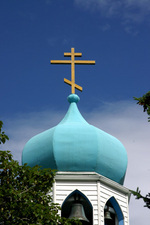 Established in 1794, the present day church built in 1945 is marked by its beautiful blue onion domes and is the third church to occupy this site. A gift store is located next to the church and is open 11-5 PM Monday through Saturday. In June 1941, 780 acres were reserved for a fort designed to be part of a linked group of permanent coastal defense installations in the area. Other forts were maintained at Long Island and Cape Chiniak. There were searchlight installations at Kizhuyak Point and Mt. Herman on Spruce Island. Battalion Headquarters was at Buskin Hill, with support barracks at the present day US Coast Guard housing in Nemetz Park. Remnants of fortification and bunkers still exist on Long and Spruce Islands. In early June of 1942, six months after the attack at Pearl Harbor, Japan bombed the naval base at Dutch Harbor/Unalaska, located in the western Aleutian Islands and captured the islands of Attu and Kiska at the extreme western end of the chain; after the attacks, the forts were manned continuously. Ultimately, there were 700-750 men and about 25 Quonset huts at Ft. Abercrombie. All the local installations together reached a top strength of more than 18,000 men; by December 1944, they were placed in caretaker status. Ft. Abercrombie was designated an Alaska State Historical Park in 1969 and was placed on the National Register of Historic Places in 1970. Located inside Fort Abercrombie State Historical Park at Miller Point, in a restored ammunition bunker. The entrance to the park is located at Mile 3.7 on East Rezanof Drive. (907) 486-7015. Admission $5.00 adults. Summer hours: open weekends only 1 to 4 PM. The museum created and maintains a central repository/archive for the preservation and exhibition of military related records, photographs, documents, technology, equipment and displays. Museum goals include the promotion and encouragement of education, tourism and historical preservation within the community. 301 Research Court, across the bridge from Kodiak City on Near Island. KFRC is committed to the preservation, enhancement and management of the North Pacific marine ecosystem and its resources. Spaces are leased to three primary fisheries research agencies, the National Oceanic and Atmospheric Administration, Alaska Department of Fish and Game and the National Park Service. The 25,000 square foot complex provides continuous seawater for wet lab research involving Alaska crab and other species. The Interpretive Center provides educational and interactive overviews on wildlife, marine life, commercial fishing and fisheries research programs found throughout the Kodiak Archipelago. Examine graphic information panels, photographs of local wildlife and marvel at the 19’ Cuvier’s beaked whale skeleton which floats suspended over the main lobby. A 10-foot diameter, 3500 gallon cylindrical aquarium and open “touch tank” comprise the lower level, offering visitors a popular hands-on interactive experience with some of Kodiak’s most fascinating tide pool creatures. The aquarium and touch tank are open to the public Summer Hours: Monday through Friday 8 to 5:30 PM Saturday 9 to 5:30; Winter Hours: Monday through Friday 8:00 AM to 4:30 PM – always closed on Sunday. 402 Center Street and Mission Road. (907)-487-2626. Website: www.kodiakwildliferefuge.org. Free admission, Summer Hours: Daily 9 to 5 PM; Winter Hours: Tuesday-Saturday 10 to 5 PM. Information may also be obtained by writing the Refuge Manager, KNWR Administrative Offices, 1390 Buskin River Road, Kodiak, Alaska 99615 or calling (907) 487-2600. Although the Kodiak refuge encompasses remote areas, the Visitor Center is conveniently located in downtown Kodiak. It features interactive exhibits, trip planning resources and the Alaska Geographic bookstore and gift shop. The refuge orientation film and other selections are shown daily and upon request. In addition, the refuge staff offers interpretive programs for visitors and assistance to schools and other groups interested in outdoor classroom experiences. Ranked as the largest US Coast Guard Base in the world and central to North Pacific operations, the ‘Coasties’ occupies the old WWII Kodiak Naval Operating Base. The Coast Guard manages over 22,000 acres of land, of which 700 acres are set aside for the Base. All government, military and retired personnel and their dependents can utilize the MWR program established on the Base for lodging, restaurants, boat rental, camping, fishing equipment plus RV parking. For lodging and RV Reservations, call the 24-hour hotline at (907) 487-5446 Ext. 1 or see their website at www.kodiakmwr.com. In 1998, the Kodiak Launch Complex completed construction on 3,100 acres of state-owned land at Narrow Cape. The $40 million facility is the only commercial rocket launch facility for sub-orbital and orbital space launch vehicles owned and operated by the Alaska Aerospace Development Corporation. KLC is the only spaceport in the United States that does not share a site with the military or NASA. Kodiak Maritime Museum is currently a “museum without walls.” The KMM began its voyage in 1996 when its founders launched a nonprofit corporation to recognize Alaska’s rich maritime heritage by preserving first hand accounts and artifacts of this illustrious and dramatic part of the state’s history. While strolling through downtown Kodiak, visit the Shelikof Avenue boardwalk overlooking bustling St. Paul’s Harbor. KMM’s unique Waterfront Enhancement Project consists of 14 full color interpretive panels that tell the centuries’ old story of “Kodiak’s Bond with the Sea.” Created to pay tribute to the island’s mariners and the community’s working waterfront, the stories illustrate Kodiak’s natural history, depict a Coast Guard rescue and the raw, unnerving power of a winter storm as experienced aboard an ice-laden Bering Sea crab vessel. The “Kodiak Waterfront Guide - A Bond with the Sea” is a handy, take-away booklet focusing on Kodiak’s maritime heritage and seafood and fishing industries. The KMM owns the original watercolors commissioned for the waterfront signs and has incorporated them into the 32-page full color guide. The museum also conducts special tours of the harbor. Called “Bow to Stern: An Inside View of Kodiak’s Working Harbor,” the guided tour encompasses the set of interpretive signs. Tour reservations must be made ahead of time by calling the museum office at (907) 486-0384. The museum also has three satellite exhibits; two are located at the Kodiak College and another at Key Bank on the downtown mall. These exhibits focus on two eras in Kodiak’s maritime history – the use of salmon fish traps and crab fishing. The fish trap exhibit includes several historic photos of fish traps, salmon can labels from that era and a model of a fish trap. The crab fishing exhibit includes preserved king crab, gear used for crab fishing and rare photos of crab fishermen on the deck of a Bering Sea crab boat. The exhibit at Key Bank provides a broad overview of the industry. A strong oral history project called “Fish Tales, Petroglyphs and Kodiak Pioneers” allows old-timers a forum to talk about their lives and how Kodiak grew from a small fishing village to one of the top fishing ports in the country. Videos can be purchased at all the museums in town. Visit www.kodiakmaritimemuseum.org for more information. In 1912 Mt. Novarupta, located on the Katmai Coast of the Alaska Peninsula erupted, blotting out the sun for two days and blanketing Kodiak with 13 to 18 inches of ash. Kodiak’s 400 residents briefly escaped to sea on a ship that was in port fueling, but soon returned to find ash drifts several feet high and spawning salmon dieing in ash-filled streams. Even after nearly 100 years, the ash remains as topsoil and in crooks of tree branches where it settled and is now covered with moss. On March 27, 1964 a massive earthquake rocked south central Alaska. The earthquake did little damage to the islands, but triggered a series of tsunamis. The fourth and largest wave crested at 35 feet above mean low tide as residents evacuated up Pillar Mountain. Kodiak’s waterfront and central business district were all but destroyed and nearby villages suffered extensive damage. Once again, Kodiak went about the business of rebuilding. 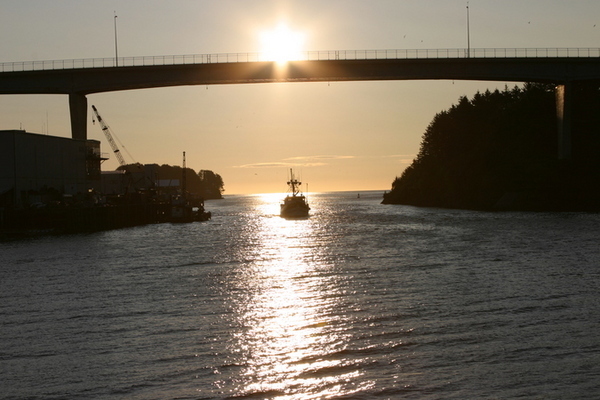 Since the early 1800s, Kodiak’s economy has been based primarily on the fishing industry. The advent of Russian occupation and the introduction of salt paved the way for commercial salmon harvesting. The first salmon cannery was built on the Karluk spit in 1882 to take advantage of the huge sockeye runs. By 1889, five canneries were operating at the mouth of the Karluk River. Intense competition led to the expansion of commercial fishing into other species of salmon. The fishery slowed when shore plants and the fishing fleet were badly damaged by the 1964 earthquake and tidal wave. As part of the effort to rebuild the industry, one of the immense emergency cargo carriers from World War II known as Liberty Ships arrived in Kodiak in 1965. Renamed “Star of Kodiak,” the ship has been used as a cannery and for frozen seafood processing and has become a Kodiak landmark. Today a thriving, year-round commercial fishing industry is the economic engine that drives Kodiak. It is the 2nd largest port for the State of Alaska and consistently ranks as one of the top five fishing ports in the US for volume and value. Kodiak Island is home port to more than 3,000 vessels and some of Alaska’s largest trawl, longline and crab vessels, up to 150 feet long. There are 19 seafood processing plants and canneries. Area residents hold more than 1000 commercial fishing permits and approximately 2000 are employed harvesting or processing seafood. The harvesting of Alaskan King crab, as detailed on Discovery Channel’s popular TV series “Deadliest Catch,”continues to be of major commercial benefit. The annual Crab Festival in May provides an unforgettable venue for an astonishing variety of activities, some unique to Kodiak. The blessing of the fishing fleet is also held at this time. The waters surrounding Kodiak Island are known for world-class fishing and yield a variety in abundance. Unlike the mainland of Alaska where fishing boat charters may need to make long runs out for miles to catch their limits or fishermen sometimes resort to combat fishing off the shoreline, captains in Kodiak find the fish on their GPS systems in close proximity to town and fish in shallow waters. Fishing can be a family sport and Kodiak captains know how to work with first time fishermen to help them achieve their lifelong dream of catching a trophy size fish. Referred to as ‘combo fishing’, charter operators will put in a full day making every effort to help clients hook their limits for halibut, salmon, rockfish, lingcod, black bass, herring and an occasional octopus or shark. King salmon weigh in at 30 to 60 pounds while halibut are a staggering 40 to 400 pounds. Halibut and king salmon start in February, sockeye and chum in May, coho and pink in June and lingcod around the first of July. Unlike other prime fishing areas, Kodiak Island has no size restriction and the highest bag limits. Book a fishing charter for a half or full day, or all-inclusive weeklong charters at reasonable rates that include equipment, bait and lunch. The larger size fishing boat charters provide a heated cabin and restroom. Fresh water fly fishing within the road zone on Kodiak offers sportsmen a fighting chance at steelhead and rainbow trout, Dolly Varden and all species of salmon, and is commonly considered “the best fishing in the world.” Nearly 350 streams in the Kodiak Archipelago have been identified by the Alaska Department of Fish and Game as annual salmon spawning waterways. Dolly Varden are good all year long, rainbow and steelhead trout year round except for a few soft months in April, May and June. King Salmon begin entering the river systems in mid-April, followed by sockeye and chum, then pink; coho finish their run in mid-October. Check with the operator to see what is provided as part of the package or for a nominal fee. There are several sport outfitter stores in Kodiak ready to supply the basics. Packages can include weeklong lodging, saltwater and freshwater fishing as well as off road ATV excursions to remote areas. A sport fishing license is required and must be in the possession of all persons 16 years of age or older while sport or personal use fishing. Licenses and king salmon tags may be purchased from vendors, by mail or online at www.admin.adfg.state.ak.us/license. The daily license fee for non-resident is $20 plus $10 for a king salmon tag. Fish should be properly vacuum-packed and flash-frozen; captains and lodge hosts work directly with Kodiak meat processors to secure your catch into heavy-duty wax-coated boxes so it can be checked as baggage or shipped as cargo with a next day air carrier. If flying back to a foreign country, seafood has to be certified as being caught in Alaskan waters with an embossed State of Alaska seal on the Certificate of Origin. The staff with the Department of Fish and Game and Division of Environmental Health work weekdays only, so plan ahead by working with the fishing boat captain. For more information contact DFG Donn Tracy donn_tracy@fishgame.state.ak.us or DEH Mike Gardner at mike.gardner@alaska.gov. There is a nominal fee for the Certificate of Origin. Whale watching, sightseeing tour and fishing boat operators offer half and full day charters and remain busy through the summer months following the migration of several species to the northern waters. From the largest marine mammals in Kodiak waters, the baleen whales, to fin, humpback, gray, sei, orca and minke whales, the bays and straits surrounding Kodiak Island provide a natural habitat to view these majestic creatures. Steller sea lions and harbor seals have their pups in June and make nearby rock formations or harbor docks their platform to bark and stand their ground. Birders delight in viewing the large diversity of resident and migratory species on land or by water. Captains can customize the boating experience with a hike on a nearby island, dinner cruise, or a photographic expedition. Whale Fest Kodiak: A Migration Celebration takes place every April, with hiking jaunts to whale watch, evening lecture series, child and adult programs offered. For more information on this 12-day event visit www.whalefestkodiak.org. Kodiak Island is world famous for fabulous hunting experiences. The Island is home to the Kodiak brown bear, the largest land carnivore in the world, weighing up to 1500 pounds. A hunter is permitted one bear every four years. Sitka blacktail deer are considered the finest tasting venison and the season bag limit is three deer. Kodiak offers a variety of sea ducks including king and Pacific eider, harlequin, scoter, oldsquaw, barrows goldeneye and mallard; the limit is 20 ducks per season. While native Alaskans are permitted to hunt for their own subsistence, specific season dates are set for sportsmen. Professionally guided fair-chase hunts, hunting camps and charters are available during the big game seasons. For more information consult Alaska Hunting at www.wildlife.alaska.gov. Kodiak National Wildlife Refuge covers almost two million acres (about 3000 square miles) within the Kodiak Island Archipelago, including two-thirds of Kodiak Island, portions of Afognak Island and all of Uganik and Ban Islands. While the City of Kodiak is accessible by frequent daily flights from Anchorage and is also served by the Alaska State ferry system, the refuge itself is only accessible by bush plane and by boat. The Kodiak National Wildlife Refuge Visitor Center in downtown Kodiak offers trip planning resources and orientation film. Kodiak National Wildlife Refuge was established in 1941 to provide and protect habitat for brown bears, salmon and other wildlife. The refuge has more than 800 miles of shoreline as well as lakes, marshes, meadows and a spine of rugged mountains rising 4,000 feet from the ocean. In addition to over 3,000 bears, the refuge is home to blacktail deer, mountain goat, red fox and land otter. The bays and estuaries offer excellent opportunities for viewing whales, porpoises, seals, sea otters and sea lions that frequent the area. 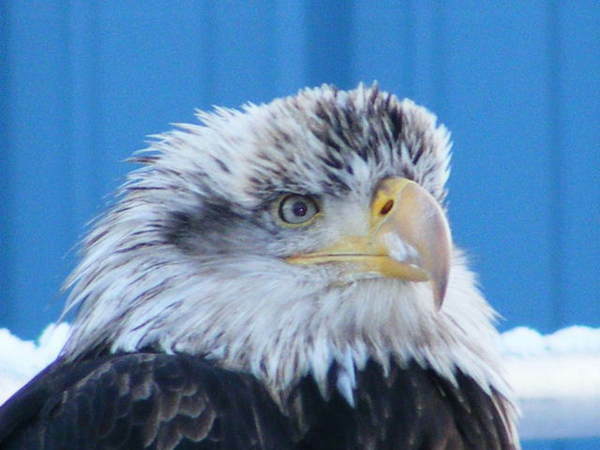 More than 200 species of birds—including at least 500 nesting pairs of bald eagles—are also found within the refuge. The area is important to sea ducks and other water birds whose combined populations number well over a million birds. Summer brings bank swallows from South America and horned and tufted puffins from deep North Pacific waters. Recreation activities within the KNWR include wildlife viewing and photography, hunting, fishing, backpacking and camping; fishing in one of the many salmon streams and bear viewing are among the most popular. In addition to Dolly Varden, Arctic char and rainbow trout, all five salmon species are native to the waterways of the refuge. A selection of remote cabins is available to visitors on a lottery/reservation basis. Kodiak bears are a unique subspecies of the brown or grizzly bear (Ursus arctos middendorffi). They live exclusively on the islands in the Kodiak Archipelago and have been isolated from other bears for about 12,000 years. They are the largest in the world, with big males weighing up to 1500 pounds and standing up to ten feet tall on their hind legs. Kodiak bear populations are healthy and productive, as they enjoy relatively pristine habitat and well managed fish populations. Bears have traditional areas they use each year, but because of the rich variety of foods available, the groups here have some of the smallest home ranges of any population. Although generally solitary in nature, Kodiak bears often occur in large groups at concentrated feeding areas, and have developed a complex language and social structure to express themselves and avoid fights. Cubs are born in January or February and weigh less than a pound, emerging from the den in May or June weighing 15 to 20 pounds. Typical litter sizes are two to three cubs, although occasionally sows are sometimes seen with five or six in tow, probably due to adopting from other litters. Most cubs stay with their mothers for three years, and become sexually mature at age five, continuing to produce cubs throughout their lives. Air charter floatplane services and boat charter operators based in Kodiak can arrange tailor made tours for Kodiak bear viewing along the secluded bays of Kodiak Wildlife Refuge, Afognak Island to the north or on the Alaska Peninsula, providing visitors with a diverse array of experiences guaranteed to make an Alaskan vacation the trip of a lifetime. Contact Andrew Airways at (907) 487-2566 or Harvey Flying Service at (907) 487-2621. Sea kayaking is fabulous around the island, offering intimate views of wildlife and stunning marine ecosystems. Half and full day excursions or extended tours are available. Shuyak Island State Park is a highly ranked kayaking destination. Scuba diving is another popular way to enjoy Kodiak waters; diving charters and services are available. 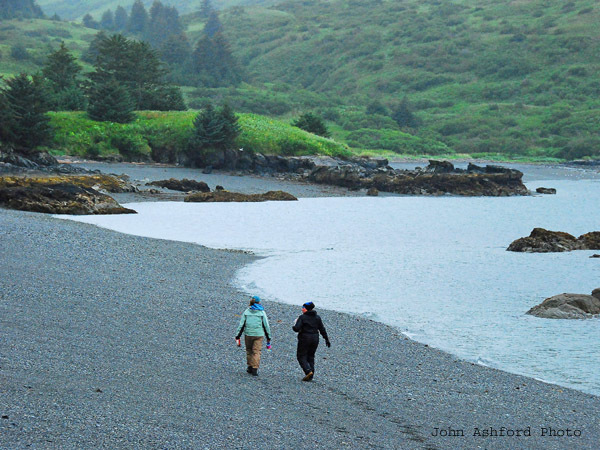 If board or wind surfing is an established passion, Kodiak beaches at Fort Abercrombie State Historical Park just north of town and Pasagshak Bay, a 45-minute drive south of Kodiak offer year round surf with 10-foot waves. Local diehard enthusiasts report surfing with killer whales and in the company of bears, surrounded by a dramatic landscape that becomes utterly surreal draped in winter ice; just be sure to bring your wetsuit and helmet. River float trips provide for leisurely exploration of the backcountry. Local guides offer customized float trip packages or experienced rafters can rent inflatable boats from the air taxi services. There are over a dozen trails, some maintained while others are not always well marked. Pillar Mountain (1200 feet), Barometer Mountain (2452 feet), Termination Point, North Sister Mountain (2100 feet), Pyramid Mountain (2401 feet), Near Island and several state parks all provide scenic beauty amid native spruce trees, wildflowers and stunning vistas. At the end of the 16-mile Pasagshak Bay Road, pre-historic fossils can be found at low tide at Fossil Beach. The Fort Abercrombie Self-Guided Historical Walking Tour highlights the remnants of World War II when the Fort stood by with 8-inch guns to defend the United States. The Army closed the fort in 1945; it became a State Park in 1969 and was designated a National Historical Landmark in 1985. Many visitors enjoy exploring the bunkers, garrison, mess hall and Military History Museum. 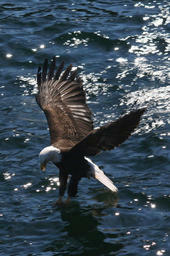 The Kodiak Audubon Society offers programs from May through September; current listings may be found at www.kodiak.org. The detailed Hiking and Birding Guide/Map is available for purchase at several locations. Museum gift stores showcase the rich heritage of local artists with their art, ceramic, fur and photography. Kodiak’s downtown Mall houses a variety of restaurants and stores. Budget Kodiak Alaska offers a fleet of cars, trucks and vans. Book early as peak season can limit the number of vehicles on the island. Conveniently located at Alaska Airlines terminal: Budget Kodiak Alaska nationwide (800) 527-0700 and local (907) 487-2220; Email: budget@eagle.ptialaska.net. Kodiak accommodations include motels, bed and breakfast inns, a hostel, vacation rentals, cabins and campsites, retreats and lodges. Due to arrival time, an overnight stay before heading out by floatplane or boat to a campsite or lodge may be required. Located downtown, the Best Western Kodiak Inn offers comfortable accommodations, in-room amenities, restaurant, meeting rooms, lounge spa and transportation to the ferry and airport. Bed and breakfast inns offer personal touches and a family atmosphere within the private homes of local residents. Amenities vary, including kitchenette and full kitchen facilities, continental or full breakfast, freezers for fish and game, hot tubs and banyans and Internet. Space is limited so plan your stay and book early. Wilderness lodges offer a variety of tailor made all-inclusive 3 to 5 day packages to their guests, providing homemade meals and family style hospitality, and access to fishing boats, fly fishing equipment and floats for salt and fresh water fishing. Experience bear viewing, either near the lodge or by floatplane to the Katmai Coast or Frazer Lake, hiking through a magnificent landscape of wild flowers and spruce trees, exploring archeological digs and petroglyphs recording ancient times, kayaking and rafting trips, or birding and viewing marine wildlife. Lodges can also assist in transportation from the mainland into Kodiak or on into the lodge. Staying flexible can allow the traveler to take advantage of opportunities created by last-minute cancellations. Allow one or two days traveling time for making connections due to weather and flight delays. Camping and RV parking is permitted only in Kodiak’s State Parks. There are RV and camping sites at Fort Abercrombie State Historical Park, Buskin River State Recreation Site and Pasagshak River State Recreation Site. Amenities include fresh water, toilets, picnic sites, hiking trails, beach and swimming access, but there are NO electrical hookups and the dumping station is located in town at the St. Paul Harbor. For a recreation guide or reservations, contact Alaska State Parks Kodiak, Alaska; phone: (907) 486-6339; email: kodiakstateparks@dnr.state.ak.us; website: www.alaskastateparks.org. The American Legion offers RV parking out on Monashka Bay Road (907) 486-3258 for details. The US Coast Guard Base also offers RV parking; for USCG lodging and RV reservations visit www.kodiakmwr.com or the 24-hour Hotline (907) 487-5446.